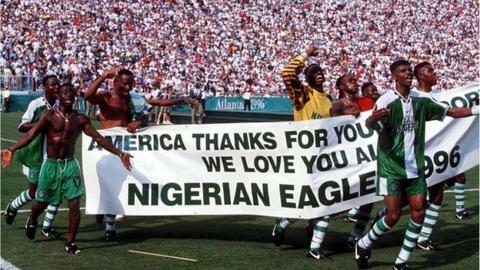 On 3 August 1996, Nigeria made history as the first African nation to become Olympic football champions at the Atlanta Games. For Taribo West, the former Auxerre, AC Milan and Inter Milan defender, that 3-2 triumph over Argentina in the final is still fresh in his memory. "The Olympics in 1996 is one of the most fantastic periods in my career," West reminisces to BBC Sport. "We had a team that could match any in the world." West says the build-up to the Games, under the guidance of Dutch coach Jo Bonfrere, was ideal despite being beaten by Togo, in Lagos, in their final pre-Olympic friendly before travelling to the USA. "Before the Olympics, we were well prepared in the USA. We were not distracted by the usual things we encounter back home in Nigeria, where family and friends can come and visit us in camp," he remembers. "We were in a very remote place and we were very focused on the task at hand. Jo Bonfrere's preparation of the team was excellent." After their opening 1-0 win over Hungary and a subsequent 2-0 victory over Japan, the West Africans lost 1-0 to Brazil in their final Group D match in Orlando, Florida. With a 2-0 win over Mexico in the quarter-finals, the "Dream Team", as the Nigerians were nicknamed back home, collided with the Brazilians once again, in what was an epic semi-final. The 31 July encounter is one that West, renowned for his dreadlocks and robust defending, will never forget. After going 3-1 down in the first half, with Brazil's Flavio Conceicao scoring in the game's very first minute, the Nigerians were in a particularly tough spot. "We knew that in the first half of that game, we had played very poorly," West admitted. "But the key to our comeback in the second half was our extraordinary determination. "The voice of the leaders came up in the dressing room. We won that match in the dressing room. "Fortunately, we had Daniel Amokachi, Sunday Oliseh and Uche Okechukwu. It was a big advantage for us." Victor Ikpeba, the AS Monaco striker who was voted as Africa's top player a year later, reduced the tally in the 78th minute. But when Jay-Jay Okocha blew the opportunity to draw level, fluffing a penalty with just minutes left on the clock, the match seemed well and truly over for Nigeria. That feeling, however, was not in the mind of Nwankwo Kanu, the two-time African Footballer of the Year. The former Ajax, Inter and Arsenal striker scored the equaliser in the 90th minute and displayed uncanny presence, agility and finesse to score the winner four minutes into extra-time, sending the Eagles' bench into delirium. After such a dramatic victory against the team of Bebeto, Roberto Carlos and Ronaldo, which had won the World Cup only two years before, West says the Nigerians were certain they had a golden date with destiny, in the final against Argentina, at the Sanford stadium in Athens, Georgia. "There was something in our spirit that made us realise that we going to win, although we didn't know how," West recalls. "As soon as Argentina got the first goal, we were not discouraged. Amunike was able to give us the winning strike. "When [Italian referee Pierluigi] Collina blew that whistle, I just collapsed on the field and knew my dream had come true. "My [gold] medal in is the bank overseas. It is something to show to my children."